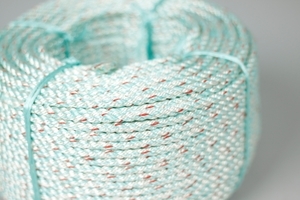 The Cordema Triviflex rope consists of a 50/50 mix of Polysteel and Polyester. The mix gives the rope a greater density then water which results in that the line sinks fast. The rope has got a relatively good protection against abration as well as a high breaking strenght. Made in Portugal. The Triviflex rope maintains its flexibility both in dry and wet conditions which makes it relatively easy to splice. UV-stabilized, green/white with a red tracer.